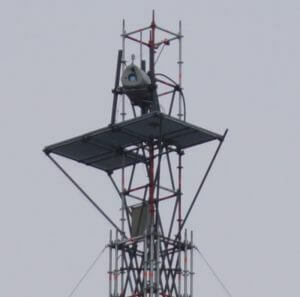 In the verification, the ZephIR DM nacelle-mounted lidar was mounted horizontally on a raised platform (FW-MM) – 180m away from two reference met masts (T-MM-N and T-MM-S) equipped with calibrated anemometers at DNV GL’s test site, located 20 km southwest of Flensburg, Germany. Verification of inclinometers. ZephIR DM uses highly sensitive positional sensors to account for turbine sway and nod to ensure a true Hub Height measurement is reported at several rotor diameters in front of the turbine within +/- 1% of Hub Height. ZephIR DM achieved a 100% availability of both system and data during the performance verification. 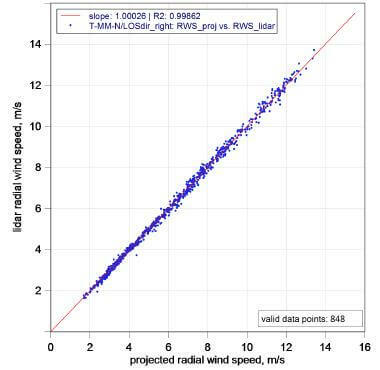 A Continuous Wave lidar, all power from the system’s laser is focused at each measurement range, which helps to ensure the highest levels of sensitivity and therefore data availability, in all environmental conditions. 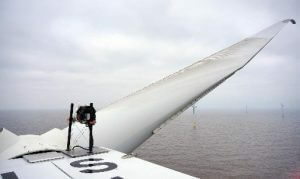 Further, the individual unit used in this test will operate as a Gold Standard Nacelle-Lidar suitable for further tests, validations and performance verifications at the UK Remote Sensing Test Site where a range of remote sensing devices undergo independent performance verification – for example a sample of 250 ground-based ZephIR 300 Performance Verifications have been published openly and available at www.zxlidars.com.